I think, more often than not, it’s good to not do that. To risk breaking the object/project/functional routine and see where it takes you. To revel in the exploration and the tenuous balance that the new path brings, because – having to think outside the box brings magic in the form of serendipity. I must admit to revelling in serendipity. We drive, and stop at random spots that look interesting and see what’s around the corner. I take a garment that I have spent quite a while making (obviously nothing perfect) and re-purpose it – loving the fact that unexpected seams and details bring more interest than there would have been otherwise. Push a painting (or drawing) that is OK but not brilliant and ride the rush that could bring total failure (or a new beginning). It’s a very freeing way to live – there is no failure, only alternate endings and new paths and absolute integrity because it’s all done ‘on the fly’. Tonight I came home to an empty house. Piles of washing as yet unfolded, this morning’s dishes in the sink and beds unmade (we left in a rush this morning). 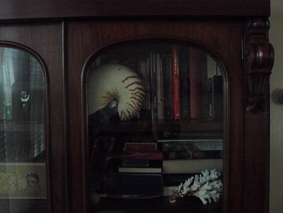 I went to my cabinet and got out the nautilus shell that my Dad and his partner brought back from their travels around Australia and marvelled at it. 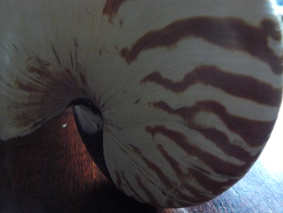 I have wanted a nautilus shell forever. 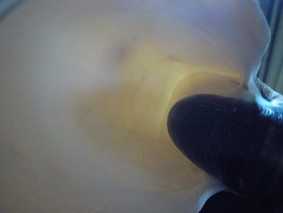 I held it to my ear in the quiet house and listened to the ‘sea’. It is beautiful, and precious and breakable and will live in the cupboard, but will be taken out at regular intervals despite the risk of breakage because something like that is too good to just lock away. Don’t you think?